We've got your back for gorgeous gifts and cards! All the fabulous treats you need with our unique range of cards, lovely jewellery, fragrances, bags and scarves, beautiful home accessories, delicious goodies from the pantry and much, much more!!! 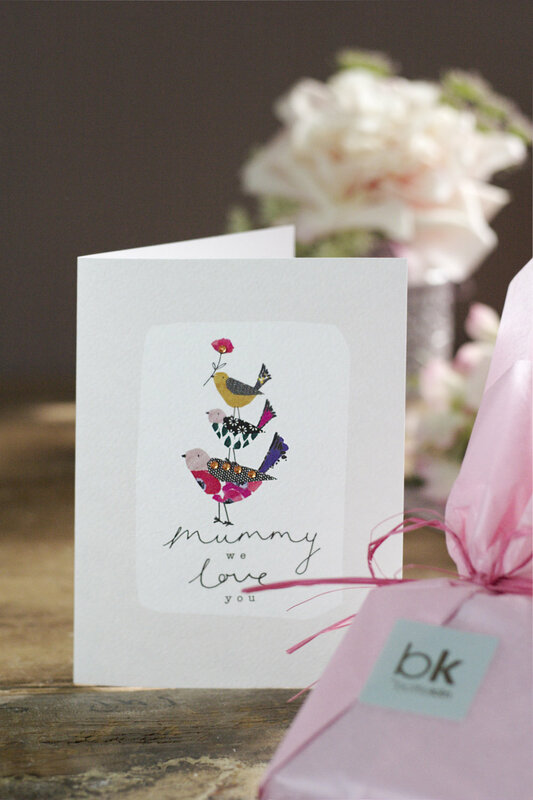 Main photo with card and wrapped gift: Stop The Clock Designs, Mummy we love you card, 3.00. 1. Katie Loxton bag, 49.99. 2. Envy Jewellery, multi strap bracelets, 13.50 each. 3. Hem & Edge scarf, 15.00. 4. Caroline Gardner heart keyring, 12.00. 5. Red Cuckoo purse 22.00. 6. Scarlet & Mustard, rhubarb & vanilla curd, 3.95. 7. The Cherry Tree, Turkish Delight curd, 3.95. 8. Classic Poems For Mother's book, 9.99. Call us or email to check the availability of items illustrated as stocks may be limited. This is only a small taster of what is in store! Subscribe to receive the bk edit and our other news by email. Exciting changes to the Café!